Didgeridoo players who visit northeast Arnhem Land or study Yolŋu culture at all invariably run into the complexities of Yolŋu kinship. I spent a lot of time trying to work it all out during and after my first visit to Arnhem Land in 1999. I understood bits and pieces through my studies and further visits, but it took the full immersion of living in Arnhem Land to get comfortable with it all. I’ve thought in the past about blogging about the subject, and finally am getting around to it thanks to a nudge from a little bird. This video from a couple years ago recently gained some new attention on social media. I for one shared it on the YidakiStory Facebook Page. Everyone calls this humbugging little corella Ngarritj, or Ŋarritj. That’s a Yolŋu mälk, or skin name, and part of the wee fella’s identity. This post introduces you to this aspect of Yolŋu kinship and identity. Everything in the Yolŋu universe is identified with one of the two moieties, or halves, of the culture – Dhuwa and Yirritja. We covered this already, mostly with an extended quote from the late Dr. Marika, ON THIS PAGE of Yidakiwuy Dhäwu Miwatjŋurunydja. In short, it’s almost as if there are two entirely different Yolŋu cultures with their own languages, ceremonies and origin stories. But they always interact, look after each other, intermarry, and give birth to each other. Every clan, person, song, animal, tree, and shape of thundercloud is either Dhuwa or Yirritja. That’s all you need to know about the moieties right now. From the outside, academic perspective, this is a ‘subsection’ system, a term going back to anthropologist Dr. A. R. Radcliffe-Brown. Similar systems are found in much of Australia. The general term ‘skin names’ refers to all these systems, but I don’t recall the origin of that term and can’t find it with a quick bit of googling. People’s physical skin has nothing to do with these names in any region I know about. If I had to guess, I’d say it’s probably a loose translation of a word from the desert that was popularized as THE English name of the concept around the country. 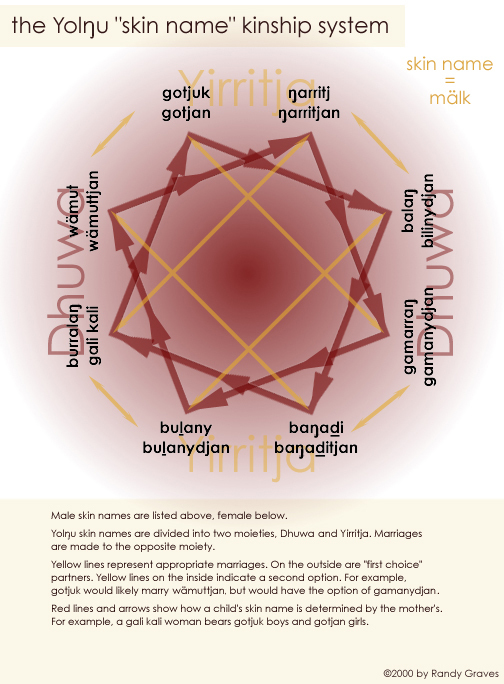 In the Yolŋu world, mälk are a set of shared personal names that have some bearing on marriage options. The Yirritja and Dhuwa moiety each have 4 sets of male/female names. Every Yolŋu person has one of these mälk/skin names and responds to it just like a personal name. Children are often called only by their mälk. Sometimes people whose personal name is the same or similar to the personal name of a recently deceased person will be called by their mälk. Sometimes people of certain relationships to each other will use mälk rather than personal names. It may sound impersonal, but is a friendly way to call out to someone. A person’s mälk is determined by their mother’s. It’s not the same as their mother’s, but determined by a set cycle. I made this chart back in 2000 for some talks I gave about my first visit to Arnhem Land. A chart of the Yolŋu mälk system. The red arrows show the passage of the names. For example, see gotjan, the female version of gotjuk/gotjan at the top left. The red arrow points to balaŋ/bilinydjan. A gotjan woman bears balaŋ boys and bilinydjan girls. If Ŋarritj the corella has any sister birds out there, they are ŋarritjan and their eggs will hatch gamarraŋ and gamanydjan males and females. Make sense? Note that Yirritja women bear Dhuwa children, and vice versa. This may help reinforce your understanding of the concept of Yothu-Yindi that we discussed in the Yidakiwuy Dhäwu HERE. Now look at the yellow arrows. These indicate preferred marriage partners. First off, note that all marriages are between men and women of opposite moieties. Now, find the buḻany male at the bottom left. He should marry galikali or bilinydjan women. Note that a galikali woman bears gotjuk/gotjan children and a bilinydjan woman bears baŋaḏi/baŋaḏitjan children. The buḻany male does not determine mälk of the child (though he does narrow down the options). In many cases, this means that people of the same mälk are brothers and sisters. But if you think about it for a while, you see how this is not necessarily the case. For one thing, due to the old practice of polygamy or any number of reasons, a man may have children with more than one woman. A buḻany man may have children with both galikali and bilinydjan women. So his own sons could be two different mälk. That said, Yolŋu mostly defer to matrilineal lines when working out relationships to each other. Still, the possible sibling connection of people with the same mälk may be used to decide a relationship to an unknown Aboriginal Person from far away or an adopted outsider. I was first adopted at Ramingining, on the western edge of Yolŋu country. When I arrived in far northeast Arnhem Land, I tried to explain who adopted me. The Yolŋu there didn’t know who I was talking about, either because they genuinely didn’t know them or because I didn’t yet know how to communicate well with them. So they decided to re-adopt me into their family based on my mälk. Since I was buḻany, I was made brother to the nearest buḻany and buḻanydjan Yolŋu in this immediate family. So how did Ŋarritj the bird get a skin name? I don’t know exactly. If anybody out there at Galiwin’ku reads this, please comment to let us know! I’d imagine it has to do with the people who found and took him into their home and the fact that his species, ŋalalak, is Yirritja. Got it? Makes perfect sense, right? OK, now you can forget it. Four years after my first visit/one year after my third visit, I thought I had this all figured. Then I discovered that a Yolŋu couple I knew well were the wrong mälk to be married to each other. That blew my mind. It is important to remember that when Yolŋu identify how they are related to other Yolŋu, they very seldom use mälk. Gurruṯu (YidakiStory: actual bloodlines) is always the important rom (YS: law) for people who can trace ancestral connections. That’s the big difference that confounded me when I first moved to Arnhem Land. Yolŋu love talking to visitors about mälk. They give you a skin name, call you by it. Perhaps for the same reason they refer to their children by mälk, although we newbie outsiders understand it less than Yolŋu 3-year olds do. But in Yolŋu relationships, the actual family lines that go back untold generations matter more than the too-tidy mälk system. The first vocabulary you need to learn to participate in most everyday Yolŋu conversations is about gurruṯu. The words for father, mother, aunt, uncle, maternal grandmother, paternal grandmother, etc. Yolŋu talk about family all the time. Their whole lives revolve around family. My own adoption never fully made sense to me until I understood that I wasn’t just a buḻany who hung out a lot with his waku, Djalu’ Gurruwiwi. During all my brief visits, I thought that should be enough information, but it wasn’t. Even though I barely knew him during my first visits, the important detail is that I’m the late Djäŋa Yunupiŋu’s brother. The fact that he was a buḻany didn’t matter at all when working out my relationship with any Yolŋu I met while living in Arnhem Land. Furthermore, mälk is (or was not so long ago) NEWFANGLED. This is the part current Yolŋu may not know or agree with, themselves. …within recent years the sub-section system has been introduced from the south and south-west, coming up the coast through Rose River and Blue Mud Bay. In the Milingimbi region it seems to have been introduced at an earlier date, through contact with the inland tribes, particularly the Rembarrnga. At Yirrkalla (sic), however, the sub-sections are not yet completely co-ordinated with the kinship terminology, and among the older people are not in constant use. This certainly helps to explain why actual relationships are better known and more useful to everyday Yolŋu life, still today. So what does this mean to you, dear reader? Honestly? Probably nothing. How many of you even read this far? The average didgeridoo player around the world doesn’t need to know any of this. Anyone who does spend any amount of time with Yolŋu will however run into these issues. I know I had a great fun playing with the mälk system, trying to understand it. I’m glad I did. You’ll have fun conversations with Yolŋu as your mind boggles over these things. Then you’ll move on. If you become more a part of Yolŋu life, you’ll understand things as you need to. This post will give you a big head start, though, and you can come back and refer to it as needed. Now go and play some yidaki. The film is delightful and well done too. The section on names and relationships is quite challenging. Whew! It is good to know what complexities exist out there though: particularly with indigenous people who have clans, moieties. Thanks again. Although not Yolngu by blood, my family I have had Yolngu skin names for a long time but had forgotten the relationships between all the different skins so your article was very helpful. I also learned a lot from the latter part of your article where you explained bloodlines are actually more important than skin name. I’m happy this was useful for you! Thanks for commenting! Happy to help! Enjoy life up there and keep away from those sand flies!